In November 2017, together with my friend Protoprinter, the idea was born to build another printer at the same time. We are both owners of large, virtually non-transportable, but very expensive printers stuffed with technology. Especially beginners often dream of the idea to build / own the largest possible printer. Once you have finally managed to build such a device and produce reasonable prints with it, you are proud at first. So we needed a contrast printer. Off-the-shelf equipment was not an option. The idea to revive a long-forgotten RepRap classic, the Tantillus! The original Tantillus was released Feb. 2012 and is from today’s view a legendary printer. The inspiring work of sublime is the cornerstone of many other RepRaps such as the 3DR Delta. Therefore our remake proudly bears the name Tantillus R (R for reborn). In the following we describe our thought processes during the reconstruction and have documented our path as precisely as possible. In today’s times when China is flooding the market with the cheapest equipment, simple printers are available for very little money. They don’t even have to be assembled, some Chinese person in a precarious working relationship does. Who cares? If you just want to print cheaply, please watch the YouTube videos in which every objectivity slips on some kickbacks. Don’t complain after two weeks if a new printer is the best on the market. If you pay for the music, you know what you’re doing. Face book, blog’s and forums with Ge**best-Links and vouchers are also a particularly valuable source of information. 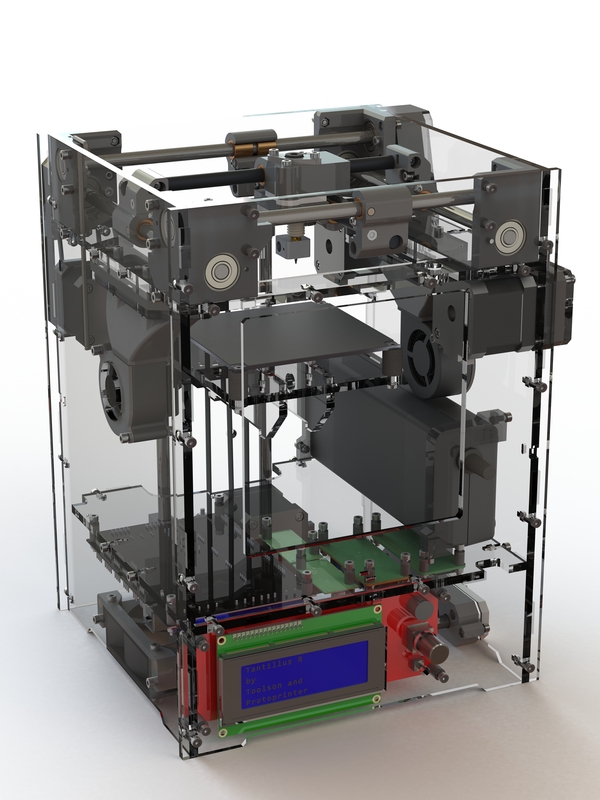 If you are looking for an open source printer apart from that, you are invited to read on. The Tantillus R is not necessarily the simplest entry-level printer, despite or because of its small size and simplicity. The bearing of the axles, the hot end, cooling concept,… require a basic knowledge of the subject. With enough patience and self reliance, even beginners should be able to produce very good printed parts from the Tantillus R.
The documentation is intended to encourage reproduction, but despite all due care, errors may have crept in. Independent action and thinking is fundamentally necessary. Attention, this preface may contain traces of irony!